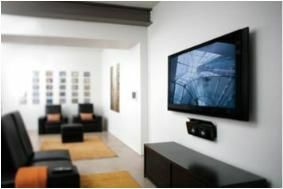 OmniMount launches four new super-slim wall mounts for TVs | What Hi-Fi? OmniMount has just the thing with a selection of four new 'ultra low profile cantilever solutions'. A bit of a mouthful but an undeniably slim-end product. The new mounts can hold flat panels from 13in all the way up to 75in, and support a weight of up to 114kg or 18 stone. That cantilever arm means you can tilt and swivel your set to your heart's content, there's sliding on-wall adjustment and integrated cable mangement. OmniMount's cantilever mounts retail at £120 (ULPC-S), £250 (ULPC-M), £500 (ULPC-L), and £600 (ULPC-X). All are available in black.